The hooky yet hard-edged, guitar-driven musical style known as power pop didn’t generate spontaneously. There were threads and uprisings—disconnected sounds that later combined into something like a movement—as early as the late ’60s, when some young rock-‘n’-roll fans were already starting to rebel against rock’s increasing pretensions and ponderousness. The impulse that led to power pop was already alive in the network of collectors of obscure ’60s garage-rock singles, and in the creators of the disreputable pop hits classified as “bubblegum.” Some key songs by Badfinger and The Move were power pop before the genre really existed, and once the sound became more viable and widely imitated, it was easier to trace the roots of the genre back to rockabilly, doo-wop, girl groups, and the early records of The Beatles, The Byrds, The Beach Boys, The Kinks, and The Who. Power pop evolved throughout the ’70s and early ’80s, running parallel and sometimes absorbing other trends like glam rock, pub rock, punk, new wave, college rock, and neo-psychedelia. But for the core power-pop sound—the one that came closest to breaking through to the mainstream and challenging ’70s rock radio’s preference for grandiosity—the best place to start is with The Raspberries. The Cleveland band’s 1972 single “Go All The Way” (written by lead singer Eric Carmen) is practically a template for everything the genre could be, from the heavy arena-rock hook to the cooing, teenybopper-friendly verses and chorus. The body of the song was The Who; the soul was The Beach Boys. The Raspberries only lasted five years, breaking up in 1975; and they only recorded four albums, of which only the twin 1972 releases Raspberries and Fresh really fulfill the promise of “Go All The Way.” (The other two albums are good, but skew more to the “power” side of the equation.) Still, The Raspberries’ initial fusion of fist-pumping guitars and sugary melodicism—and the chart success they had at the start—inspired young rockers across the Midwest. While The Raspberries didn’t last long enough or stay true enough to popularize power-pop, the genre’s next big band had a stronger impact. Cheap Trick, formed in Rockford, Illinois in 1973, were pegged by critics early as one of the great hopes for the survival of meat-and-potatoes American rock ’n’ roll. Less cutesy and more muscular than The Raspberries, Cheap Trick really picked up the post-Beatles mantle of Badfinger, and gave it some middle-American blue-collar beef. The band’s earliest albums were packed with classic, catchy rock anthems like “Southern Girls,” “Come On, Come On,” and “I Want You To Want Me,” but Cheap Trick really started to catch on with 1978’s Heaven Tonight (and its polished almost-a-hit single “Surrender”) and the 1979 live album At Budokan. Cheap Trick spent the next decade as solid sellers, while scoring the occasional chart breakout, but the band warred with its own sound throughout the ’80s, sometimes embracing pop, and sometimes rebranding as a mainstream hard-rock group, complete with power ballads and glammy videos. 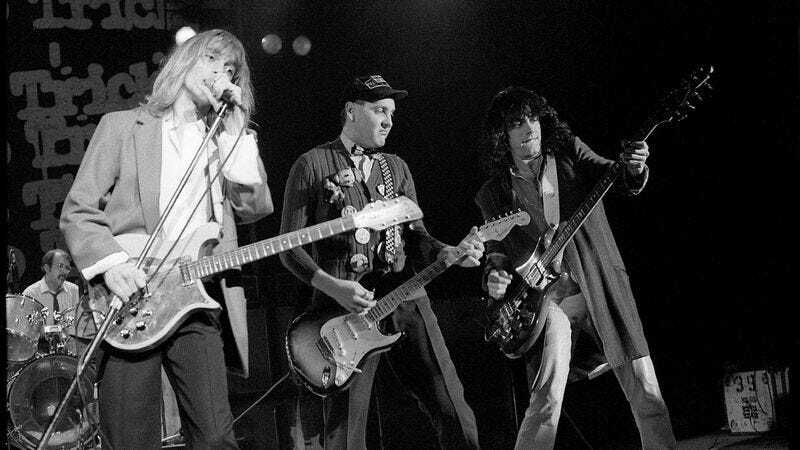 The reasons for Cheap Trick’s identity crisis may have had something to do with the trouble power pop had catching on—not just with the public, but with the top rock critics of the era, who were frequently distrustful of the genre’s elements of sweetness and simplicity. Even the acts that the critics did embrace often languished in obscurity, as Cheap Trick did in the early going. One of those beloved bands that never could get a break: the Los Angeles trio The Nerves, who were the talk of the West Coast club circuit during their brief lifespan (1974-78), but only recorded one four-song EP in that time, and were eclipsed by the burgeoning L.A. punk scene. That 1976 EP did produce one enduring classic, though: the surging, sweaty pop song “Hanging On The Telephone,” later covered by Blondie. The writer of “Hanging On The Telephone” was Jack Lee, who turned out to be the one member of The Nerves that didn’t stick long with power pop, or the music business in general. As a solo artist, Lee dabbled in punk and art pop, and wrote one more big song: “Come Back And Stay,” which became a hit for Paul Young. But it was the other two Nerves—Paul Collins and Peter Case—who’d leave a more lasting mark on the genre. After The Nerves ended, Collins and Case stuck together as The Breakaways, then split up, with Collins fronting The Beat and Case steering The Plimsouls. Initially, The Beat seemed more likely to break wide, given Collins’ clean riffs and snappy rhythms, but instead The Beat became one of a legion of tersely named power-pop bands that landed major label deals in the late ’70s but could never do better than a few regional hits and a smattering of respectful but unenthusiastic three-star reviews. Today, away from the swarm of similar-sounding records, The Beat’s first two albums sound a lot fresher and brighter—two of the best of their era and genre. As for The Plimsouls, they picked up where The Nerves left off and became one of the hottest bands in L.A., though they couldn’t convert that into record sales until they appeared in the movie Valley Girl in 1983, and subsequently had a small but significant hit with the song “A Million Miles Away.” Case then went solo, abandoning power pop for an early form of alt-country, on a string of critically acclaimed albums. Unlike their contemporaries, Shoes actually signed with a major label, Elektra, and released three albums and an EP that, while slicker than Black Vinyl Shoes, retained that record’s shimmering riffs and dreamy harmonies. But the band lacked the punchy sound and big anthems that could’ve made them the next Cheap Trick, and it didn’t have the performing experience that carried the various members of The Nerves. Beyond their legacy of great music, Shoes’ greatest contribution to power pop was the studio they built, Short Order Recorder, where they’d record some of the next great wave of power poppers, including Material Issue. During that Cheap Trick/Knack heyday, though, a bunch of new bands popped up from the underground, nosing at the charts with some of the era’s best rock singles. Examples include: Detroit’s The Romantics, whose “What I Like About You” remains a clap-along crowd-pleaser, and should’ve been the hit that “My Sharona” was; Berkeley’s The Rubinoos, who followed up their 1977 cover of “I Think We’re Alone Now” with the giddy 1979 song “I Wanna Be Your Boyfriend” (later famous for being ripped off by Avril Lavigne for her hit “Girlfriend”); Charlotte’s The Spongetones, whose 1981 single “She Goes Out With Everybody” is the best Merseybeat song ever written and recorded by an American band; and Los Angeles’ Great Buildings, which sprung from the ashes of the artier L.A. band The Quick and should’ve had a monster smash with 1981’s power-pop classic “Hold On To Something.” (This band found some chart justice later when its main members re-formed as The Rembrandts and recorded the theme song to Friends). Any one of the aforementioned songs could stake a claim as the quintessential power-pop single (as could “Go All The Way,” “A Million Miles Away,” “Southern Girls,” and several listed later), but they’d all have to make their case against The Records’ 1978 masterpiece “Starry Eyes,” which has just about everything a power-pop song needs: a brisk beat, a rising lead-guitar lick, punchy chords, tight harmonies, an evocative chorus, and the feeling of being young, in love, and in a speeding convertible. More than most power-pop bands though, the UK-born Records suffered from being in the wrong place at the wrong time. In the late ’70s, Great Britain was teeming with musicians making daring, original music, and in that context, The Records seemed practically reactionary, with their old-fashioned hooks and booming sound. Most of The Records’ UK contemporaries found ways to tweak their sound to fit more comfortably with punk and new wave. The reason most rock scholars date the beginning of power-pop to 1972 is because of three albums released that year: The Raspberries’ Raspberries; Big Star’s #1 Record, and Todd Rundgren’s Something/Anything? Emerging from the ’60s Philadelphia band Nazz—either the last of the first wave of American garage-rock acts or the first of the revivalists, depending on where the line gets drawn—Rundgren’s first two solo albums eschewed the Who-like muscle of his old group in favor of the quirkily soulful singer-songwriter music of Laura Nyro. But with Something/Anything?, Rundgren started bringing elements of his rockier sound back, both in uptempo pop songs like “I Saw The Light” and proto-power poppers like “Couldn’t I Just Tell You.” Neither this album nor Rundgren’s discography as a whole is easily pigeonholed as belonging to any one genre. Rundgren experimented with prog, art rock and new wave in the ’70s—both on his own and with his band Utopia—and he may be better known for his ballads than his rockers, generally speaking. But Rundgren has remained a fellow traveler to power pop throughout his career, both as a producer for bands like Cheap Trick and XTC, and as a writer/performer of punchy, catchy songs. With Utopia in particular during the first half of the ’80s, Rundgren embraced the genre with a fervor he’d never shown before, and recorded some of his most accessible records. If nothing else, Rundgren set a precedent for the smart singer-songwriter as a viable power-pop offshoot. The acts in the “101” section represent power pop (for the most part) as aggressive and obvious in the best possible way; but there were also artists who were attracted to the jangle and sparkling choruses of power pop, but didn’t necessarily need the bluster. The prime example: Dwight Twilley, a Tulsa-born rockabilly fan who moved to Los Angeles, scored a surprise Top 20 hit with The Dwight Twilley Band’s first single, 1975’s “I’m On Fire,” and then spent the rest of the decade trying (and failing) to capitalize. Twilley was hampered by problems with his label, and by his reverb-heavy style, which was a little more pillowy and halting than the rock getting radio play in the late ’70s. But that was radio’s loss. Twilley’s three ’70s albums—Sincerely, Twilley Don’t Mind, and Twilley—are all sterling, with a spacious sound and Beatles-esque hum, anchored by a deep, rootsy beat, and one memorable song after another. The Paley Brothers are one of the lesser-known acts from this softer, jangly side of power-pop. They recorded one self-titled album, and collaborated with the Ramones on a track for the Rock ’N’ Roll High School soundtrack; then Andy Paley went on to a successful career as a producer and TV- and movie-soundtrack composer. But it’s too bad he didn’t get more traction from The Paley Brothers LP, which is one of the few power-pop albums to make explicit the Everly Brothers influence that ran deep in artists like Twilley and Seymour. The singer-songwriter who best melded The Beatles and Buddy Holly was Marshall Crenshaw, whose eponymous 1982 debut is a revelation even 30 years after its original release: a flawless pop album with rich, tuneful songs that could’ve been written by mid-’60s Brill Building veterans, and with a sound that’s shiny, springy, and modern. Marshall Crenshaw wasn’t a big hit, but it did fine, made a slew of critics’ best-of lists, and even landed one song in the Top 40: the peppy rockabilly-informed number “Someday, Someway.” Crenshaw and his label Warner Bros. tried to build on the momentum of the debut with 1983’s Field Day, produced by British wunderkind Steve Lillywhite, who’d previously found sonic depths in guitar-driven acts like U2 and XTC. But Lillywhite’s big sound overwhelmed Crenshaw’s lighter touch, and though Field Day has worn well over time—thanks largely to a set of songs as good as Crenshaw’s first batch—Crenshaw lost a lot of the support he’d gotten just one year earlier. By the time of his third album, 1985’s still-wonderful Downtown, Crenshaw was playing up the twang more, shifting more towards straightforward roots-rock, which is where he’s primarily continued to dwell (though he’s never completely lost his pop sensibility). At least Keene got a chance to go national. Nashville’s Bill Lloyd spent the first half of the ’80s trying to make a go of it as a rocker, with his band The December Boys (a nod to Big Star’s power-pop classic “September Gurls”). When he couldn’t break out beyond the regional college-rock scene, Lloyd teamed up with Radney Foster—whom he’d met in the Music City songwriter mills—and as a country duo, Foster And Lloyd had a string of hits on the country charts in the second half of the ’80s. Lloyd then returned to guitar-pop as a solo act, recording several bright, likable records. But it’s too bad that the songs compiled on Lloyd’s solo debut LP, 1987’s Feeling The Elephant, didn’t garner more attention at the time. Lloyd’s “This Very Second,” “It’ll Never Get Better Than This,” “Lisa Anne,” and “Nothing Comes Close” are all the equal of anything by Twilley, Crenshaw, and Keene, and while these songs probably had no better shot at becoming Billboard hits than the records of his contemporaries, they could’ve at least benefited from some of the same boost from the critics. In retrospect, the 1972 release of Big Star’s first album—the cheekily titled #1 Record—is one of the major events in rock ’n’ roll history. Former Box Tops singer Alex Chilton joined with Chris Bell, Jody Stephens, and Andy Hummel in Memphis to record an album that was like a ragged shadow to The Raspberries’ polished power-pop debut: a mix of The Kinks and The Velvet Underground instead of The Who and The Beach Boys. While #1 Record drew strong reviews, label woes kept it from reaching a wide audience, and by the end of the ’70s, Big Star had been so marginalized by rock history that the band’s records didn’t even appear in the first Rolling Stone Record Guide, published in 1979. (They didn’t make the second edition in 1983, either.) Even though #1 Record is as much a blueprint for power pop as Raspberries, it’s become emblematic of the cultish, regional side of the genre: bands, scenes, and records that suffered bad luck, even by the standards of a musical style that was rarely widely popular. In the Big Star albums that followed (and in Bell’s posthumously released solo album I Am The Cosmos), Chilton and company delivered some of the most beautiful and transcendent songs in power-pop history, including “September Gurls” and “Thank You Friends.” But they also experimented with dissonance and decay, setting a standard for the artsy, non-commercial side of their chosen sound. Any survey of the small-time but often-amazing bands that followed Big Star’s example should start in Memphis, the home of two acts that ran in Big Star’s circle. Van Duren was a friend of Chris Bell’s, and recorded the little-heard 1977 album Are You Serious?, which is a remarkable fusion of Big Star, The Raspberries, and Todd Rundgren, relying on piano, synthesizer, and snaky guitar to create a power-pop sound that doesn’t sound quite like anyone else’s. And The Scruffs bridged the gap between Big Star/Raspberries-esque pop boogie and the nascent punk sound that was coming out of New York around the time of their snotty 1977 debut Wanna Meet The Scruffs? In the ’70s, just about every American city of any significant size had a power-pop band that seemed poised to be the next Raspberries or Cheap Trick. In Fairfax, Virginia, that band was Artful Dodger, who recorded three albums for Columbia between 1975 and 1977, combining toe-tapping tunes with the earthy grit of The Rolling Stones. In Youngstown, Ohio, it was Blue Ash, a band that deserves a spot in the pantheon just for the 1973 single “Abracadabra (Have You Seen Her? ),” which is just the kind of down-to-the-last-nerve, riff-heavy stomper that makes power-pop such a joy. And in Oak Park, Illinois, Off Broadway tried to draft off of the rocket trail of fellow Illinoisans Cheap Trick, though Off Broadway’s excellent debut album On was less forceful and more slyly new wave-ish than anything by Rockford’s favorite sons. Over the past decade, the archival label Numero Group has done a fine job of collecting obscurities from regional scenes on compilations like the recent Buttons: From Champaign To Chicago, which pulls from the fertile Illinois territory, and Yellow Pills: Prefill, which has great tracks from bands like Colors, Luxury, The Treble Boys, and The Tweeds. (The lattermost band’s “I Need That Record” doubles as a statement of purpose for crate-diggers everywhere.) But the most essential of the Numero Group power-pop anthologies is Titan: It’s All Pop!, which spotlights the output of the Kansas City indie Titan Records, home of such solid-to-superior acts as Gary Charlson (who played up his similarities to Dwight Twilley and Phil Seymour by covering The Dwight Twilley Band’s unreleased single “Shark (In The Dark)”) and The Boys (who suffered from sharing a name with a British punk band, but whose singles and demos for the cash-scrapped Titan were as good as any that the major labels were pushing at the time). But the regional power-pop band that, for a time, seemed closest to becoming the next Big Star (for better or worse, given that band’s sputtering career trajectory) was Sneakers, a group of North Carolinians who moved to New York and became critics’ darlings for their blend of garage-rock and southern twang. They just arrived a little too early, in a mid-’70s NYC that had too many innovative and unusual punk and art rock bands for Sneakers to stand out. The members of Sneakers had better luck in the ’80s when they formed new bands. Chris Stamey and Will Rigby became The dB’s (with Peter Holsapple), and transitioned from power-pop in the early ’80s to the more eclectic kind of jangly southern pop that dominated college radio; while Mitch Easter formed Let’s Active, whose production brought more psych pop and new wave elements to their sound. One of power pop’s biggest impediments to mainstream success was that there were so many other genres in the ’70s and ’80s that relied on brisk tempos and big guitar hooks, often delivered by bands that had more of a sonic edge or a distinctive look. In the U.S., for example, the first wave of neo-garage bands, led by New York’s The Fleshtones, were as active in reviving ’60s rock simplicity as any of the feather-haired Midwesterners were; ditto the Ramones, who could get fists pumping with the best of them. This overlap was even trickier in the UK, where pub-rockers like Bram Tchaikovsky skirted the edges of power pop occasionally, and where a revival of the short-lived ’60s mod movement produced even more music than the original wave, with bands like The Chords and The Lambrettas aping The Who better than The Raspberries ever did. The UK punk scene also produced several bands with strong pop sensibilities, most notably Rich Kids and Buzzcocks, who could easily have been more like 20/20 if they’d grown up in Oklahoma instead of on the other side of the Atlantic. In fact, there were plenty of bands and singer-songwriters in the ’70s and ’80s who recorded power-pop songs without exactly fitting into the genre. The most notable is The Flamin’ Groovies, a bluesy San Francisco bar band that was active in the late ’60s, then spent some time in England in the ’70s and recorded one of the Top 10 power-pop singles of all time, “Shake Some Action,” with producer Dave Edmunds. And Edmunds himself approached power pop at times from the rockabilly side, both solo and with his band Rockpile, a collaboration with former Brinsley Schwartz pub-rock icon Nick Lowe. For Lowe’s part, as the flagship artist for Stiff Records, he tried out just about any style he thought would sell, and that included writing songs like “So It Goes” and “Cruel To Be Kind,” which could’ve been the anchor of any regional American power-popper’s repertoire. One of Stiff’s lesser-known bands, Any Trouble, also had a lot in common with power-pop, especially on its tuneful 1980 debut Where Are All The Nice Girls. And new wave’s angry young men—Graham Parker, Elvis Costello, and Joe Jackson—all dabbled in the backbeats and big riffs of power-pop from time to time during the late ’70s. In fact, a lot of British new-wave bands played a version of power pop, skewed by their own eccentricities. XTC’s music was too anxious and arty on the whole to belong in the genre, but songs like “Life Begins At The Hop” and “Generals And Majors” have a power-pop kick (and the band did work with Todd Rundgren on 1986’s Skylarking, which contains the pure power pop wonder that is “Earn Enough For Us”). The similarly psych-pop-influenced The Soft Boys were too straight-up weird to be called power pop, though the band’s two main creative forces—Robyn Hitchcock and Kimberley Rew—played with the genre more openly in the ’80s. Rew in particular is a hero to many power pop fans for playing guitar and writing the best songs for Katrina And The Waves, who initially had a rockier guitar-pop sound before their American label cleaned them up and made them one-hit wonders. One of those Rew-written Waves classics is “Going Down To Liverpool,” which was later recorded by The Bangles, a band that was associated with the West Coast’s “paisley underground” of the early ’80s. The paisley groups were generally more interested in the trippy, rootsy, cosmic Americana qualities of ’60s rock, though some bands—like The Three O’Clock and Game Theory—also sported the unmistakable influence of The Raspberries and Big Star in their more straightforward pop-rock songs. While power-pop fans who prefer forgotten 45s from Nebraska bar bands may bristle at this comparison, two of the biggest hits of the mid-’80s —The Outfield’s “Your Love” and The Hooters’ “And We Danced”—are both essentially power pop, just given more contemporary, radio-friendly production. Those bands’ other songs are less on-point, but they still merit a mention for being part of an ’80s return to middle-of-the-road rock bands who got by on songs more than personality, which is what the big power-pop wave of the late ’70s seemed to promise. Steeped in reverb and cooing background harmonies, Marshall Crenshaw is a throwback to doo-wop and mid-’60s West Coast pop, though songs like “Cynical Girl” and “I’ll Do Anything” have enough new-wave edge to make Crenshaw sound vital and modern—not just a throwback. Though #1 Record is the purer power-pop record, 1974’s Radio City is one of the all-time best rock albums—full stop. No longer just trying to recreate and reinterpret their ’60s rock fantasies, Big Star broke those sounds apart, re-contextualizing adolescent heartbreak songs as something heavier and more genuinely tragic. The Murphy brothers’ major-label albums are more polished and easier to like, but the living-room recording Black Vinyl Shoes has a lo-fi charm that makes it stand out from the power-pop pack even now. Through the tinny murk—sounding like it was “produced by elves,” according to critic Robert Christgau—the songs’ chiming guitars and fluid melodies remain unshakable, yet that homemade sound also makes Black Vinyl Shoes feel more personal. Recorded when Cheap Trick was still a weak-selling critics’ darling—albeit huge in Japan—At Budokan is like every power-pop fan’s fantasy version of the genre, where their favorite bands play magnificent rock songs in front of 12,000 screaming fans. Perhaps the audacity of that was all that was needed to break Cheap Trick wide, since the album went Top 10 and triple-platinum. Technically, Lloyd’s debut album was released in 1987, which puts it outside the 1972 to 1986 range of the original power-pop wave, but the songs on Feeling The Elephant were all recorded in the first half of the decade and were intended to launch Lloyd’s career as the next Marshall Crenshaw. It’s too bad that plan didn’t come to fruition. For the most part, power-pop was a singles medium, but track-for-track, Feeling The Elephant is as impressive as any LP the genre ever produced. For more power-pop classics, check out this extensive Spotify playlist.